: All-in-one point is a service that can be managed by me to win easy points and a coupon for a small Chamber of people. 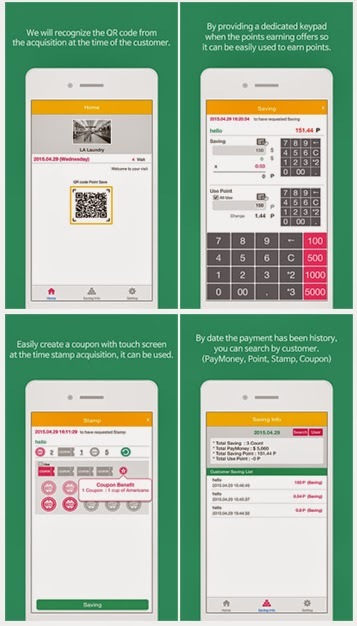 1) Recognizes the QR code in the application, it will be able to win easily and quickly your points and coupons. 2) It offers a way to earn points acquisition method and the stamp. 4) Through a point and the coupon acquisition, it will induce the customer re-visit. 1) won, dollar, euro, Yen, Yuan, Pound Etc. It is possible to make the point earned in the six currency. 2) Cumulative rate supports up to one decimal place. 3) Acquisition relates to the use of the point in the case settlement amount to use the points I will except. 4) By providing a dedicated keypad when the score points, we can easily acquired. 1) You can set the number of stamps. 2) When the stamp is all acquisition, coupon will be issued. 3) It is possible to provide benefits in accordance with the number when using the coupon by providing a coupon benefit information. ※ But it can also be used to recognize immediately the QR code in a store app, After you print to capture the Home screen or QR code, you can use at the store.